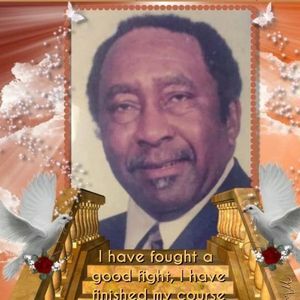 WISE, THOMAS ALPHONSO SR., 80, of Whitesboro, NJ, passed away on Saturday, January 19, 2019. He was born to the late Edward Wise and Selena Epps Wise-Porter in the city of Asheville, NC. Thomas was the oldest of six children. Thomas was affectionately known as Tommy Porter as well as Pop-pop. Tommy attended school in Asheville, NC, graduating from Stephen Lee High School, where he was known as the best male tenor of all times. He was the first male Black singer on WLAS-TV. After graduating from high school, he moved to New Jersey. Thomas accepted Christ at an early age. Some years after moving to New Jersey, making lots of friends and touching many lives, he met his wife, Julia, to whom he wed on July 25, 1965. From this union four children were born, Tonya, Thomas, Kevin and Maya. He also had 16 grandchildren and 10 great grandchildren. Thomas was employed by the City of Wildwood Crest until a near fatal accident. He also worked for the City of Wildwood as a summer policeman in the '70s. He then for the next 21 years was employed by Atlantic Human Resources as a Head Start bus driver. He was loved by the children and parents alike. Then seeking even better employment he went to work for the NJ DOT as a truck driver from which he retired. He was also a member of the Male Tones and a Deacon at First Baptist Church of Whitesboro for many years. He then moved his membership to Christ Gospel Church of Whitesboro which still remains. Thomas was a loving and faithful Husband and Father. Services will be February 2, 2019 at Christ Gospel Church, 2209 Route 9 South, Whitesboro with visitation from 9:30am until 11:00am. A celebration of life will begin at 11:00am. Interment will be at Household of Ruth Cemetery in Whitesboro, NJ. Create An Online Memorial For Thomas A. Wise, Sr.